In this pAsuram, mAmunigaL is following AzhwAr’s pAsurams of saying “for me who has my senses fully for the sake of bhagavAn, there is no shortcoming” and is mercifully explaining it. How is that done? AzhwAr said “Not only my senses were withdrawn from others due to engaging my senses in them being inapt, I also got to engage my senses fully in bhagavAn; what more do I need?” in thiruvAimozhi 3.10 “sanmam pala pala“; mAmunigaL mercifully explains this starting with “sanmam pala seydhu“. ulagIr – “Oh residents of this world! AzhwAr mercifully explained “Oh residents of this world! In this birth, I acquired the joy of always praising the auspicious qualities of sarvESvara who is having the goodness of incarnating many times and protecting these worlds; at least one day praise such AzhwAr, to have your tongue scarred [due to that praising]. As “sanmam pala pala seydhu” pAsuram [1st pAsuram] is the main pAsuram in this decad, mAmunigaL is mercifully explaining based on that. sanmam pala seydhu – Assuming innumerable incarnations as said in “sanmam pala pala seydhu” [1st pAsuram], SrI bhagavath gIthA 4.5 “bahUnimE vyathIthAni” (countless births have passed), purusha sUktham “bahudhA vijAyathE” (incarnates many times). sanmam pala seydhu thAn – He who is not bound by karma, incarnates many times for the sake of his devotees as said in SrI rAmAyaNam bAla kANdam 18 “kausalyAjanayath” (kausalyA gave birth) and in SrIvishNu purANam 5.3.14 “jathOham yaththavOdharAth” (I was born from your womb). ivvulagaLikkum – Protecting the samsAris (worldly people) who don’t understand his greatness. It is said in SrI rAmAyaNam bAla kANdam 1.2 “guNavAn kaScha vIryavAn …” (Who is with guNam (qualities) in this world now? Who is very potent now?). Only sarvESvara has the quality of eliminating the enemies and gently caring for those who are his devotees. Here, it is talking about SrIvishNu purANam 1.22.21 “na hi pAlana sAmarthyamruthE sarvESvaram harim | …” (Oh wise person! Except for hari who is well situated in sustaining others, no one has the ability to give protection) and “ulagil vaNmai udaiya arakkar asurarai mALap padai porudha nanmai udaiyavan sIr” (the qualities of the noble emperumAn who could destroy the cruel demons of this world) [1st pAsuram]. ivvulagaLikkum nanmai udaiya mAl guNam – Whatever AzhwAr said in “sIr paravap peRRa nAn” (I who got to enjoy emperumAn‘s qualities) is said by mAmunigaL here as “mAl guNaththai nAdORum – immaiyilE Eththum inbam peRREn“. After reaching the divine abode of SrIvaikuNtam (paramapadham), one would praise emperumAn as said in purusha sUktham “… vipanyava: …” (those who are wise and have the nature of praising [him] constantly, reach that supreme abode of vishNu) and “viNNOr paravum” (praised by nithyasUris) and would enjoy bhagavAn‘s qualities as said in thaiththirIya upanishath “sOSnuthE sarvAn kAmAn sahabrahmaNa:“; I got the same joy of praising him and enjoying his qualities, here in this world itself. The same is explained in AchArya hrudhayam as “kuRaivu mUttup parividar thuyar thunbamallal dhukkam thaLarvuk kEdugaLinRi amruthAnandha magnarAnavar” (AzhwAr who became immersed in the ocean of nectar (bhagavAn’s qualities) after being freed from sorrow, limitations, fatigue etc). Eththum inbam peRREn enum mARanai ulagIr nAththazhumba Eththum oru nAL – Oh wordly people! Praise the AzhwAr who said “I got to praise emperumAn‘s qualities”, until your tongue becomes scarred with that praising; even that need not be done for many days, just one day is sufficient. There is no restriction to praise as in the case of emperumAn as said in thiruvAimozhi 4.5.3 “vivil kAlam isai mAlaigaL Eththi mEvap peRREn vIvil inbam miga ellai nigazhndhanan mEviyE” (for me who got to praise and elaborately speak about Saurya, vIrya, parAkrama and swAmithva, vAthsalya towards his devotees, there is no dissatisfaction (in enjoying any aspect of bhagavath vishayam)) and in thiruvAimozhi 6.4.6 “pagalirAp paravap peRREn” (I got to praise him in day and night); just once praising him to get a scar in the tongue – it will be most enjoyable in all manner. This relates to AzhwAr who is said in kaNNinuN chiRuth thAmbu 2 “nAvinAl naviRRu inbam eydhinEn” (I acquired joy just by reciting his name with my tongue). 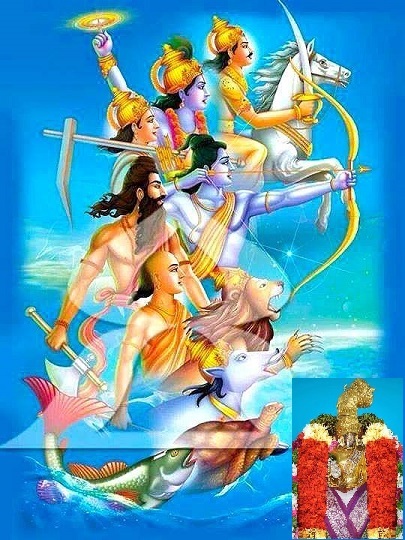 This entry was posted in Other, thiruvAimozhi nURRandhAdhi on January 17, 2019 by Sarathy Thothathri.